I’ve asked three brilliant sculptors to select one of their pieces and walk us through it, starting with the money-shot and then taking us on a tour of the hidden beauty and mysteries few, if any of us, will ever get to see. To read Part 1 of the series, click HERE. Tony Cipriano is, without a doubt, the most natural sculptor I’ve ever known. He was born to it. There ain’t nothing he can’t sculpt; super heroes, movie monsters, dames, animals, cartoon characters and everything in between. But what the guys does great - kills at – is portraiture. And he’s a damn nice fellow. But I heard he can’t dance to save his life. When I look at a piece of sculpture, the thing that usually draws me the in the most is the surface texture. I LOVE a loose, painterly approach to figurative sculpture. I love to see the 'hand' of the artist in the clay. 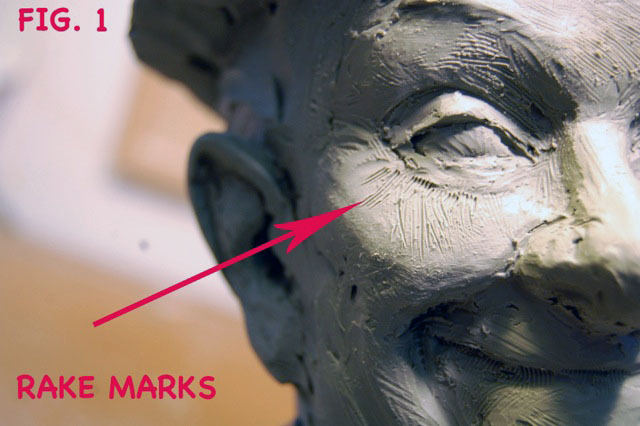 Rarely if ever, does a commercial sculptor get a chance to leave loop marks, fingerprints, or rake marks in the surface of his piece. Sculpture for product requires a smooth finish to accept a full color paint job. Ironically, I've made my living doing just this for 17 years now and it goes against everything my brain and hands are wanting to do when I sculpt. 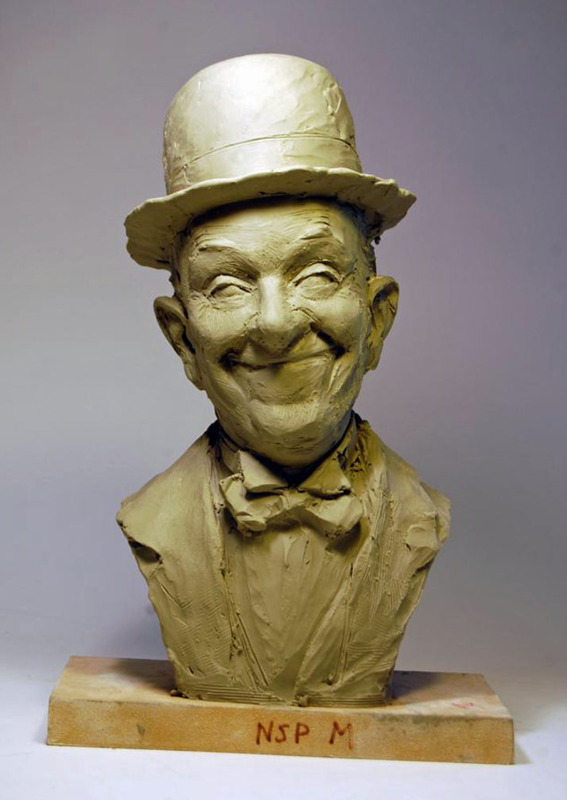 This is 1/2 scale work-in-progress portrait of the great Stan Laurel. 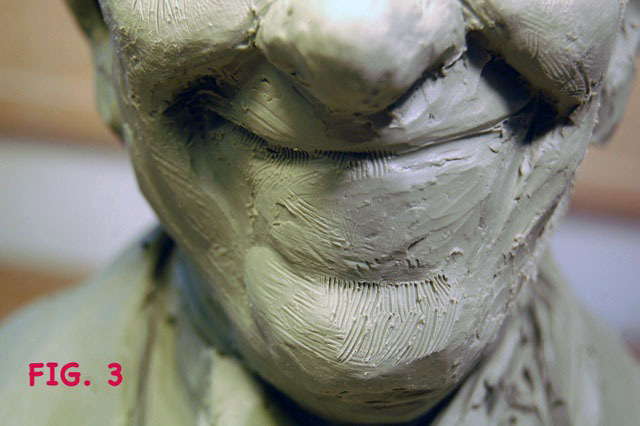 It's being sculpted with MEDIUM GRADE CHAVANT NSP oil based clay. I am a huge fan , and am doing this for my own pleasure. ( Personal pieces like this where I love the subject usually turn out to be my best work) . Doing these portraits gives me a chance to do what I want--to work unhampered by production restraints and art direction. Of course, I want to try to capture the likeness and the personality of my subject, but I do not want to noodle. I am not concerned with skin pores or hyper-realism. The fun part for me is to catch the likeness, pose, gesture, attitude. After that, it becomes work. I want to try to catch my subject as quickly as possible and walk away. Hopefully, in doing so, the energy that went into the sculpt will remain. Too many times, I work on a piece too long and the life just goes out of it. It's also why I rarely do sketches first. I think the thing should be done fast and loose and solving problems on the fly makes for more fun and a better piece.... Just my opinion. I am going to try my best to stop before I begin to 'noodle' the surface. Figures 4 & 5 show what I like to call, large, directional ' thumb smooshes'. 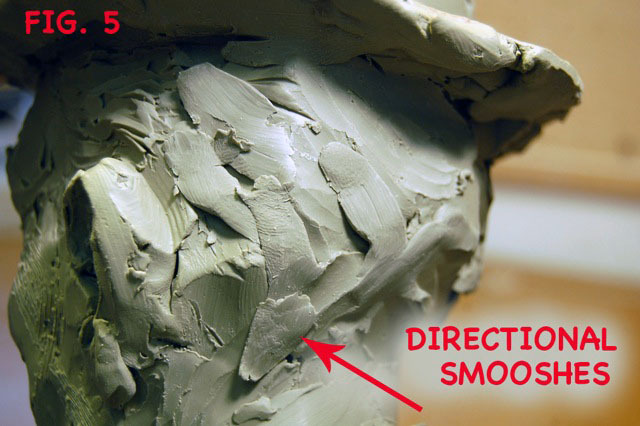 I love trying to describe an area using one fell swoop of clay. 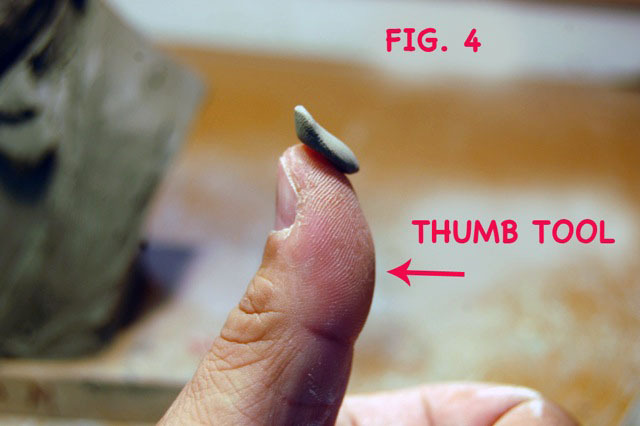 I take a small bit of warn clay on the tip of my thumb and SCHMEAR it across the surface, much like you would SCHMEAR a New York bagel on a Sunday morning. 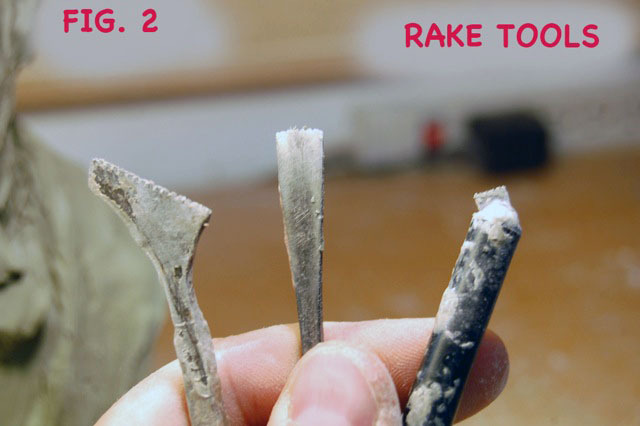 Figures 6 & 7 show loop tool marks. 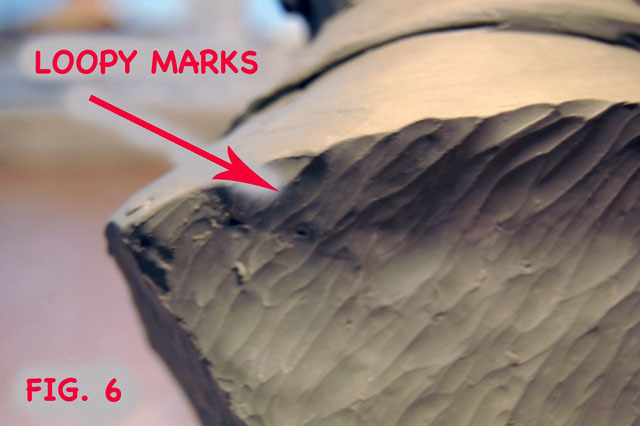 I sometimes leave these all over a surface, but most of the time, I reserve leaving the loop marks for the backs or 'cut-away' areas of a sculpture. 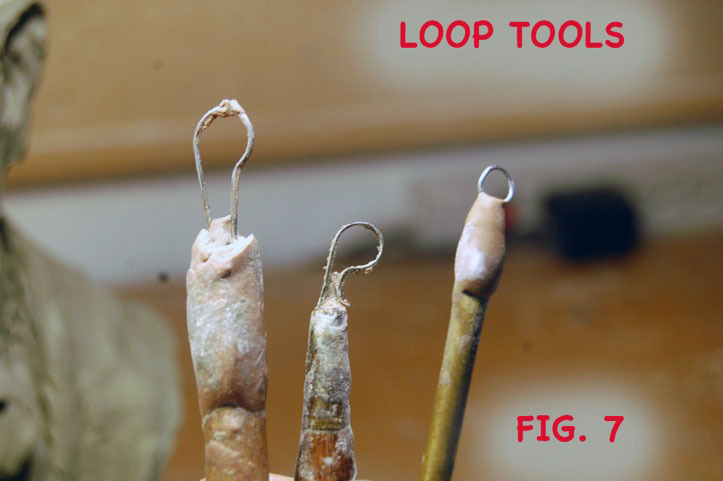 It's a design element, but I like the 'wood-cut' feel of the loop tool. It gives the impression that the head was 'carved' out of stone or a much harder material using a chisel. Figure 8 shows my favorite, the fingerprint! These usually are accidental--and only show up after the piece has been cast. But I enjoy seeing them pop up now and again. Too some, it may seem amateurish to leave these in your surface, but to me, it LITERALLY shows the hand of the guy who made this. 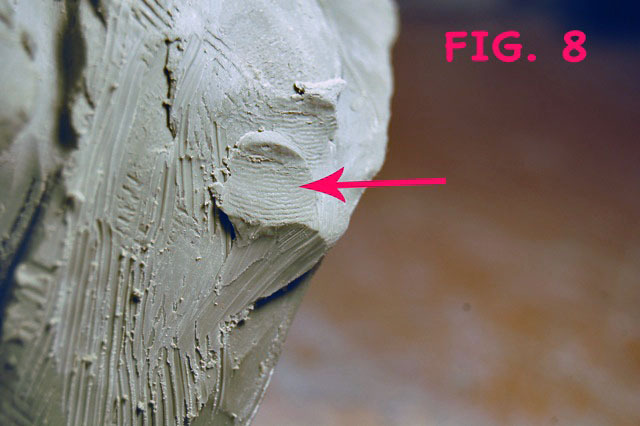 I shows that this lump of clay was made by a human hand and not a rapid prototype 3D printer. Figure 9 shows the full piece....in progress. As you can see, form a distance, all of these little marks disappear. But in person, you can see them, run your fingers over them, love them...as I do. 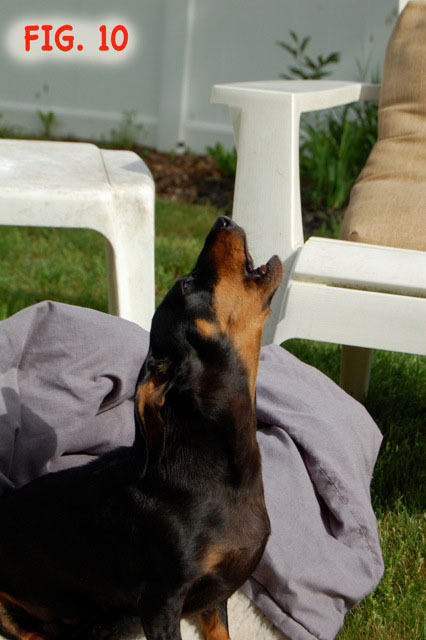 Figure 10 is a dachshund. Of course, all of these techniques really show up beautifully with a bronze patina. And that is the point; I WANT them to show up. In spite of the fact that I have been buffing wax with fine steel wool and ladies nylons for 17 years to try to achieve a glass-like surface, my own 'personal work' style does not lend itself to full-color paint jobs. If I do something for ME, it is meant to have a monochrome-colored surface.